Very haigh detailed 3d model of the cableway linking Oia and its port, in Santorini. There are six cars on the left track and six on the right one. When the right one go up, th left ones go down. 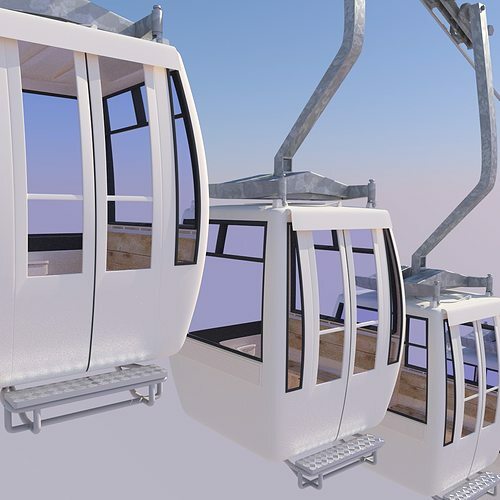 But you can use it as a generic cableway car. > Original model created in Blender 2.66. > Preview images rendered in Cycles render engine. > Interior with seating and details modeled. > Shader setup included in .blend file only. > The file contains only one cableway car, the other ones are only copies. > High detailed binding (rotated 25 degrees in preview images). > Detailed enough for close up renders. > Two levels of subdivision in preview images not applied in download file. > All objects centered in the origin. > All objects and materials have significative names. > 3ds and DXF files are tiangulated because of the conversion. You could have to relink the textures to the objects, but it should be easy becouse textures have the same name of the material they refer to.